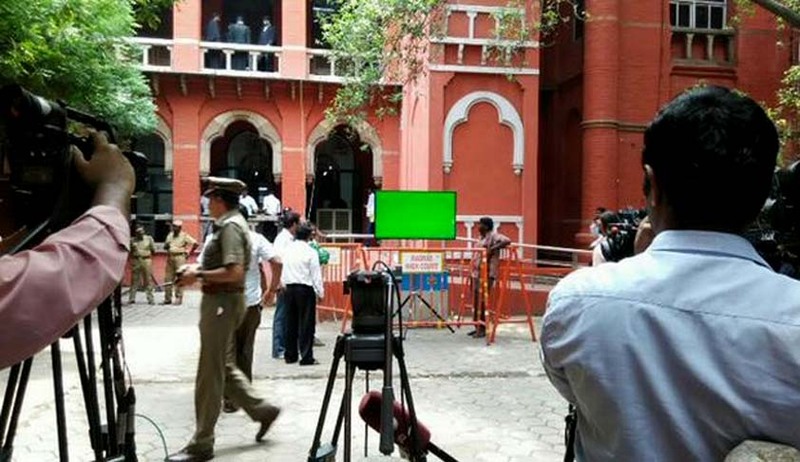 For the first time in its history, the proceedings of the Madras High Court were beamed live today when contempt of court proceedings against two Madurai-based Bar leaders were taken up in connection with the anti-helmet rally taken out by lawyers in that city last month. Secretary of Madurai Bar Association A K Ramasamy and its President P Dharmaraj are facing contempt of court proceedings in connection with the anti-helmet ruling rally, which was a protest against the Court's June order that made helmets mandatory for two-wheeler riders. The heavy protection was provided to the campus in view of directions made by a Division Bench of the court, apprehending "illegal" activities during the hearing. The case was telecasted live from the court of the division bench comprised of Justice S Tamilvanan and Justice C T Selvam. The proceedings were telecasted in live outside the Court through a 55cm LED television, installed away from the court hall, since the entry to the Court hall was restricted to a few advocates who are related to the case. There were barricades everywhere and there is no way an advocate or litigant or media person’s could go anywhere near the court hall. On September 16th, when the contempt case was taken up, despite barricades, three busloads of advocates from Madurai allegedly created havoc in the premises. As a result the entry was blocked on all corridors near the court hall where the bench heard the case this time. However, the move to telecast the court proceedings live to the public was unwarranted, said some of the advocates. Unlike the last hearing, only a handful of lawyers from Madurai came for the hearing today, they said.